Northwest Roofing Is a Premier Roofing Company With a BBB A+ Rating. When it comes to roofing contractors Fort Worth residents call Don Rutherford of Northwest Roofing. A resident of Haslet, Texas since 1997, Don Rutherford has been a roofing contractor for over 25+ years. Got a roof problem? Call Northwest Roofing! Northwest Roofing is a reputable roofing contractor in Haslet, Texas, serving Tarrant, Denton, Wise and Parker Counties. Since its beginning in 1997, we have grown our company with the simple formula of “Affordability with Excellent Customer Service.” Northwest Roofing’s founder and owner, Don Rutherford, who believes that every homeowner deserves the best when it comes to roofing services. That formula of “Affordability with Excellent Customer Service” is as true today as it was when Northwest Roofing first began. Northwest Roofing is committed to providing affordability, highest quality roofing products, years of roofing experience, a variety of roofing services and excellent customer service while becoming the most trusted roofing company in the industry. Visit our Gallery of Homes and see for yourself the many types of roofs that we have worked on using only the highest quality shingles. Every homeowner deserves to be treated with respect and every home to be protected by a quality roof. Since your roof is responsible for protecting you and your family, pets and perhaps a home business, Northwest Roofing wants to ensure every homeowner that we do every job right the first time. It’s sad but true to say that we’ve helped many customers recover from defective and careless roof repairs and roof installations done by inexperienced roofers who failed to take pride in their workmanship and complete a roofing job the right way. Many times, Northwest Roofing is called to a home only to find and solve the problems caused by other careless roofing contractors. Northwest Roofing will always get the job done right the first time. We guarantee it. DO YOU NEED A ROOF REPAIR OR A COMPLETE REPLACEMENT? Northwest Roofing is a professional roofing company providing roofing services which offers everything you will need for your roof repair or replacement. Northwest Roofing is fully equipped to handle any roof damage or small roof leak repairs to a complete replacement of your roof. If there is insurance involved, again no problem, we can help you make the best choice for your situation and will work with your insurance company to get your claims processed as fast and as smoothly as possible. 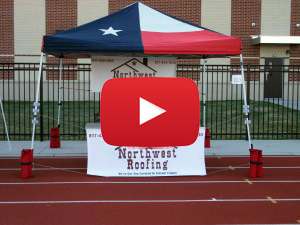 Northwest Roofing is a premier Fort Worth roofing company. Since 1997, we are an established residential roofing company located locally which you can depend on year round, year after year. We are not one of those “storm chasers” better known as the unknown pop-up “roofing companies” which disappears after the storm has passed through. Northwest Roofing is a stable company which you can contact us anytime you need us. Our customer’s testimonials are the proof of our history and our honesty, integrity and our work ethics. We are proud in how we do business. BBB Accredited Business since November 2005 with an A+ Rating and a flawless record. We will guarantee that we will give you our best because your satisfaction is important to us at Northwest Roofing. 7 REASONS TO CALL NORTHWEST ROOFING NOW! Northwest Roofing is an established roofing company since 1997. A full-service residential roof repair or replacement roofing company. Will work with you and your insurance company. We treat every job as if it was our own home paying attention to every detail. We offer many other services such as replacement of skylights, chimneys, vents, and other important fixtures on your home.